If you want to brighten your smile with cosmetic dentistry in Reston, the first thing you should do is call Expressions Dental Care for a consultation. An initial consultation may be the most important part of a smile makeover. A detailed explanation of each procedure. Your options for scheduling the process (all at once or over time). By listening carefully, communicating clearly, asking the right questions, and working together, we can determine your needs and make the best choices for you and your oral health. We not only provide consultations to adults but for the whole family as well. For more information about family dentistry or cosmetic dentistry in Reston, feel free to call our office during normal business hours. The bottom line? At Expressions Dental Care in Reston, we understand that the appearance and health of your smile are essential to your self-esteem, and to your overall health. Our experienced staff has years of professional experience in dental care and our patients always leave feeling better about their smile. Furthermore, our staff always prioritizes our patients’ satisfaction, because we wouldn’t be here without our valued patients. Our cosmetic dentistry options include teeth whitening and porcelain veneers. 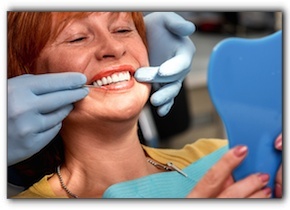 Visit our smile gallery for some before-and-after pictures of some of our satisfied patients.